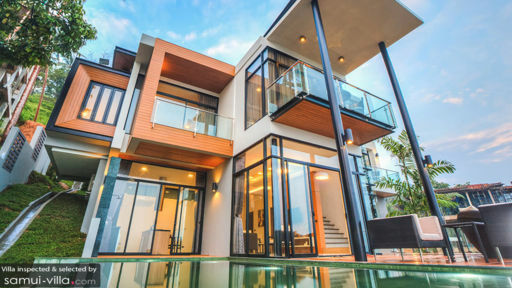 A stunning contemporary tropical villa located in Chaweng, North-East Samui, Villa QNa is a three-bedroom home away from home which offers mesmerising views of Chaweng beach and is merely 10-minutes from the popular nightlife of the area. If you’re traveling with friends or family, the villa is ideally suited as it is located over two levels and even boasts of a luxurious infinity swimming pool with breathtaking views. Lounge outdoors with a drink in hand as you enjoy the tranquility of the area, or head on out to explore the town with your loved ones! The three bedrooms at Villa QNa are all deemed as master suites owing to their lavish furniture and spacious layouts. They are furnished with king-sized beds and even lead to private balconies that have been furnished with armchairs from where you can relish the view. Each of the bedroom is accompanied by an en-suite bathroom which is fitted with modern and convenient amenities. There are large windows and air-conditioners to keep the rooms cool and air. If you wish, you can catch your favourite shows on the flat-screen! 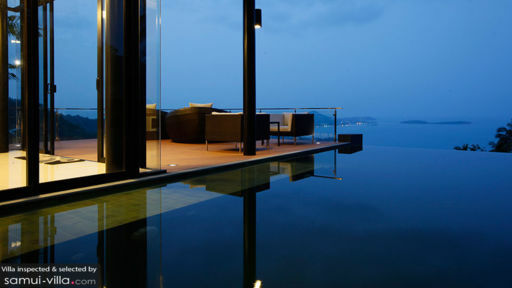 With a spectacular panoramic scene lying ahead, what more but an infinity pool as the cherry on top. Lounge and chill by the pool or in its cool, crisp waters as you gaze at infinite views of the ocean or simply to breathe in the fresh air. Once you’re done with that, you have the luxury of lounging on the poolside chill zone which has been furnished with comfortable sofas and coffee tables for a nice spot of tea, some drinks, and even snacks. The villa is surrounded by luscious greenery that only adds to the vista. As you enter the main living pavilion at Villa QNa, you will be blown away with its elegant furnishings, classic decor, and opulence that is rooted in its very interiors. The gorgeous space offers a comfortable and inviting space where guests can come and rest up on the cozy sofas. It is separated from the pool deck via sliding glass doors that also offer a beautiful view. 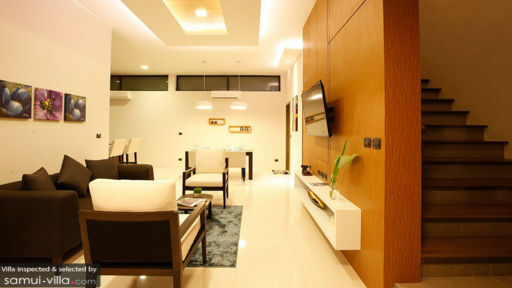 Minimal decor only enhances the understated and luxurious beauty of the living area. A wall-mounted TV is sure to keep you entertained and busy if you’re just lazing on the couch taking your own, sweet time. The rest of the space in the living area is occupied with western kitchen and the comfortable dining area which can accommodate up to six guests. The fully-equipped kitchen is an open-kitchen with a island and barstools that are perfect for quick bites and drinks. The state-of-the-art kitchen is fitted with the modern technologies to make cooking a breeze and hassle-free. There is so much to do at the villa including getting a private massage, learning to cook your favourite Thai curries, grocery shopping by the staff to prep for your meals, etc. You can make requests for car and bike rentals to go about town in the best way possible. Chaweng is the party hub of Samui with its various night clubs and restaurants that are open till late. It would be a fun experience to head there on your first night out and get a feel of the place. During the day, you have the Chaweng beach to explore, build sandcastles, sunbathe, and swim!